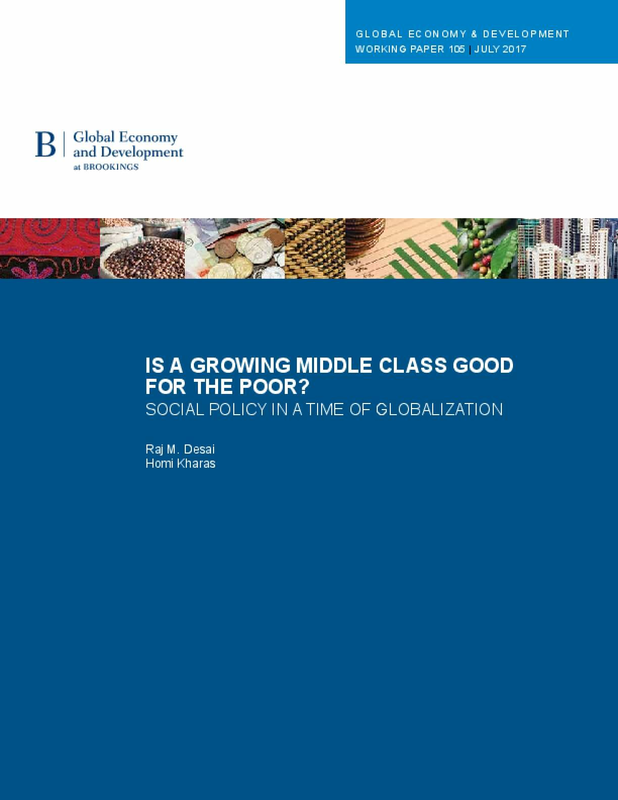 We examine the effect of the rise and evolution of the middle class on extreme poverty, using the World Bank's international poverty line of $1.90 per person per day in 2011 purchasing power parity (PPP)- adjusted terms. Like the definition of poverty, the definition of the middle class used here is also set in absolute terms, comprising households where per capita income or consumption lies between $11 and $110 per person per day in 2011 PPP terms—referred to as a "global," as opposed to national, definition of the middle class (Kharas, 2017). We argue that middle-class expansion initially is pro-poor given the incentives of the emerging middle class and the working poor to cooperate on matters of social policy. As citizens join the ranks of the middle class, they lobby for programs that provide them income stability and protections against shocks (social insurance). By allying with the working poor who seek social assistance (income transfers), middle-class constituents increase their bargaining power relative to elites who seek labor flexibility and lower taxes in a competitive global economy. Over time, however, as the middle class prospers and acquires greater political influence, the balance of programs shifts increasingly toward social insurance and away from social assistance. In this way, the middle class begins to capture an increasing proportion of the benefits of social spending, leaving less for welfare services targeted exclusively at the poorest. One implication of this is that the emerging middle class has never been truly progressive, because progressivity ultimately comes at its own expense.